SaveOnEnergy 2017 Green Report: Top Universities in the U.S. Here at SaveOnEnergy.com®, we’re constantly on the lookout for noteworthy progress in eco-friendliness and sustainability. We believe that change is not made all at once, but achieved through the collective efforts of individuals and organizations working together toward the greater good of protecting our planet. Recently, we took a look at universities in the U.S. that share this value. 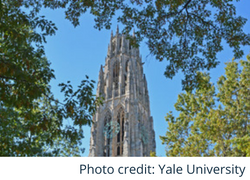 To create this list, we assessed the newly released 2017 U.S. News & World Report Top 100 Universities list and ranked them based on a number of eco-friendly factors. 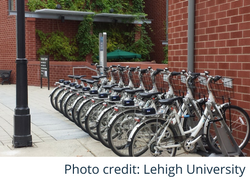 Below are universities and colleges in the U.S. that actively prioritize sustainability and reducing their carbon footprint through various on-campus initiatives and community partnerships. To learn about how our rankings were determined, see the methodology section at the bottom of this report. 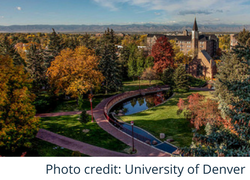 While many universities in the U.S. employ sustainability programs and education tracks, the universities that made our list received high scores in all areas assessed. Did your university or alma mater make the list? Note: The SaveOnEnergy Green Score is on a scale of 1-100, with a higher score reflecting a higher ranking. Conversely, the U.S. News College Score reflects each university’s ranking based on various non-green factors. Finally, the Princeton Review Green Rating is on a scale of 1-100, with a higher score reflecting a higher ranking. 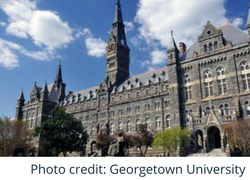 Guided by its core values of “people, planet, prosperity and purpose,” Georgetown University employs various initiatives that prioritize eco-friendliness. 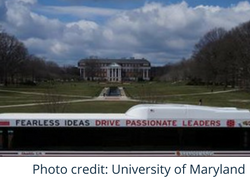 In 2016, four solar-powered outdoor chargers were installed throughout the campus – a joint effort with the Georgetown Energy and Environmental Network – to give students a place to charge their laptop, phone or tablet while using renewable energy. In addition to these solar chargers, the university emphas environmental awareness through its campus-wide composting program, utilized by many students. 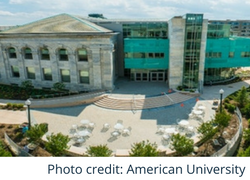 American University strives for zero waste and is working toward achieving this goal through exhaustive composting, recycling and collection efforts. Instead of garbage cans, separate bins designated for the recycling of specific items – such as metal, paper, plastic or food – are scattered throughout the campus, making it easy for students to divert waste from the landfill. 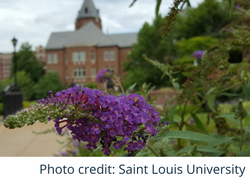 From a campus-wide Meatless Mondays initiative to an onsite student-tended garden and rainwater collection system, George Washington University (GW) students, faculty and staff make sustainability a daily practice to decrease their carbon footprint and help protect the planet. 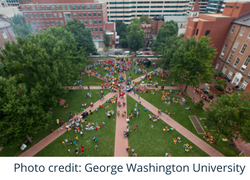 The GW Ecosystems Enhancement Strategy, for example, is an ongoing plan to improve the campus’ ecosystem through the creation of urban gardens and increase of natural, sustainable space. 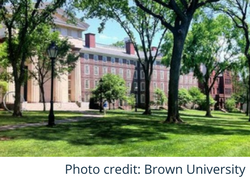 With its “Brown is Green” initiatives that aim to create a more eco-friendly campus and community, it’s clear that Brown University’s sustainability efforts are helping make a difference for future generations. For the past five years, it has held Brown Unplugged: Do it in the Dark – an annual dorm energy competition that challenges students to unplug over a period of three weeks. The incentive? 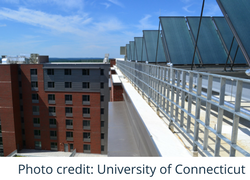 The dorm with the highest percentage of energy reduction at the end of the contest wins an array of coveted prizes, plus recognition from the university president. 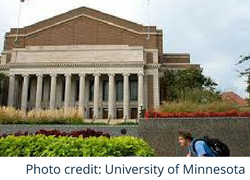 At the University of Minnesota-Twin Cities (UMN), promoting global sustainability is a top priority. 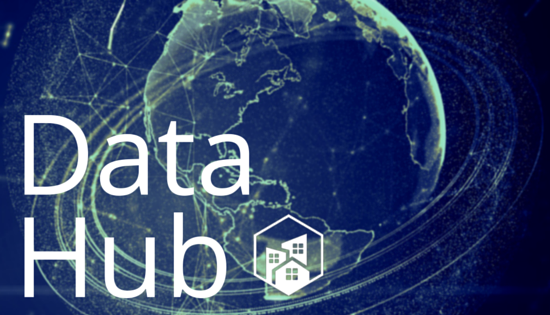 Its Global Water Initiative is dedicated to evaluating worldwide water sustainability by mapping points of water use and availability across the globe. On the homefront, the UMN Office of Sustainability and its “It All Adds Up” campaign is working toward becoming carbon neutral by 2050. 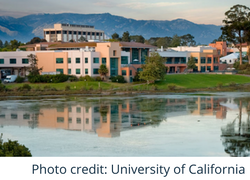 By retrofitting campus buildings to reduce carbon output and holding zero waste events, the university is optimistic about seeing this goal become a reality. 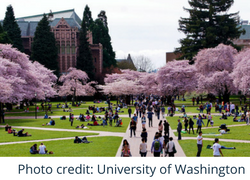 At the University of Washington (UW), students, faculty and staff are encouraged to divert trash from the landfill whenever possible. 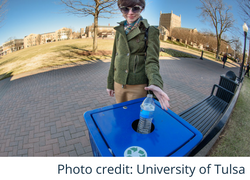 During the last fiscal year, 62% of campus waste was reported as either recycled or composted. Keeping in step with this initiative, the UW Surplus Store is an on-campus program that helps find a new home for unused campus equipment – such as small appliances – while the university’s salvage wood program repurposes removed campus trees into lumber for campus furniture. 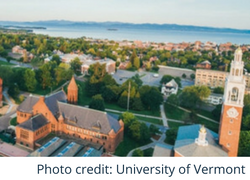 In addition to offering its popular sustainability education track, the University of Vermont encourages students to practice eco-friendly behavior in all aspects of their day-to-day lives. In addition to having several LEED-certified buildings onsite and employing a strategic usage of renewable energy, the school also collects donations of used campus furniture to be upcycled rather than sending them to the landfill. 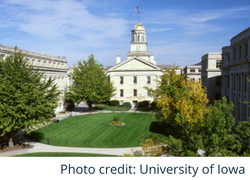 Holding a silver-level rating for bicycle-friendliness from the League of American Bicyclists, the University of Iowa (UI) is committed to providing multiple alternative transportation options for its students, faculty and staff. With a free on-campus bus system, a popular ride-share program and bike-friendly campus, UI seeks a 10% reduction to its carbon impact from transportation. Furthermore, through frequent waste audits and the RecycleMania reward program, UI is progressing toward a firm goal of diverting 60% of campus waste from the landfill by 2020. 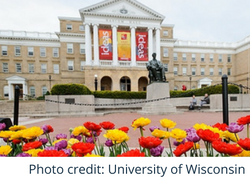 Each academic year, the University of Wisconsin-Madison sets aside $50,000 for its Green Fund, which supports up to four student-initiated projects each academic year. Any student in good standing can apply for funding, but must have a project in mind that helps reduce the environmental footprint and operating costs of on-campus facilities in the areas of solid waste removal or energy and water conservation. At Dartmouth College, sustainability isn’t just a campus initiative – it’s a way of life. 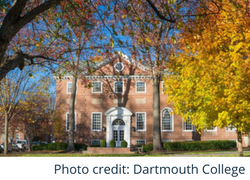 With a goal to help “change the world through sustainability innovation at the intersection of operations and academics,” Dartmouth is employing efforts to help this goal become a reality. An early adopter of a campus recycling program in 1988, it has since adopted several effective sustainability programs. The goal? To help conserve valuable resources so people around the world can have access to clean water, nutritious food, safe shelter, basic sanitation, accessible energy and adequate medical care. To round out the top 25 universities, here are the remaining 15 that also earned a high SaveOnEnergy Green Score. Note: See the methodology section at the bottom of this report for detailed information on how rankings were determined. 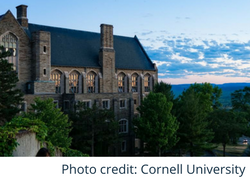 To complete the list, here are the final 77 schools from the U.S. News & World Report Best Colleges Top 100 list and their SaveOnEnergy Green Rank. What Are Other U.S. Universities Doing to Go Green? 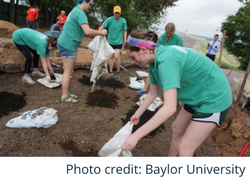 Many schools on the U.S. News & World Report Top 100 list have a strong focus on sustainability and are employing effective initiatives to make their campus eco-friendly. From school or community events that promote sustainability to robust recycling programs, here are some of the notable ways that they are doing their part to help the environment. In addition to their internal eco-friendly factors, the presence of robust community and state sustainability initiatives also played a role in determining each school’s final ranking. Universities in communities with a high density of farmers markets per capita or abundance of green jobs, for example, earned higher scores. These factors, as well as those reflected in the infographic below, play an important role in lowering both the community and state’s carbon footprint and reminding residents of the importance of protecting the environment. 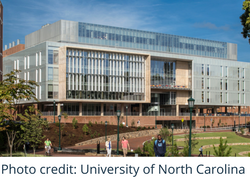 Note: Numbers next to each university reflect its SaveOnEnergy Green Score in the corresponding category, not its overall SaveOnEnergy Green Score. To learn more about how category scores were determined, see the methodology section at the bottom of this report. Note: On the map above, the number of green campuses in each state reflects universities from the 2017 U.S. News & World Report Best Colleges that also earned a SaveOnEnergy Green Score. Only the universities found on the report were taken into consideration, not the overall number of universities in the state. Grey states indicate those without a university on the Top 100 report nor a SaveOnEnergy Green Score. When creating this list, we re-ranked universities found on the 2017 U.S. News & World Report Best Colleges list and awarded them a SaveOnEnergy Green Score based on specific eco-friendly factors. To determine university rankings, we looked beyond the campus itself and investigated the communities in which each school is located. In addition to taking each school’s Princeton Review Green Score into consideration, we analyzed data detailing farmers markets in the state using the 2015 USDA Farmers Markets by Community list, reviewed the community’s public transportation options and walkability using WalkScore.com, investigated the density of parks near each university using The Trust for Public Land 2015 Park Score, reflected on the state’s eco-friendly energy options based on the Department of Energy Renewable Energy by State score and looked into the amount of green jobs in the area by reviewing the U.S. Bureau of Labor Statistics Green Jobs State Report. Walk Score: 20% – Score was created as a composite score of walkability, biking and public transportation options adjusted to a scale of 1-100. Green Jobs Score: 10% – Adjusted to a scale of 1-100. Farmers Markets Score: 10% – Scoring based on the number of markets per 1,000 residents. ensity of parks in the closest city to each university. Department of Energy Renewable Energy by State: 20% – Adjusted to a scale of 1-100.